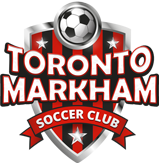 Welcome to the Toronto-Markham Soccer Website. This site gives information about both St. Michael’s Soccer Club and Maple Leaf Soccer Club that offer men’s outdoor and indoor soccer programs in the Toronto, Scarborough and Markham area. With multiple divisions of play available across a number of days and nights, our leagues are able to accommodate you or your team, regardless of whatever skill level you may be seeking. Maple Leaf Soccer Club and St Michael's Soccer Club are open to those 18 years and older, regardless of skill level and experience. Our programs run from the beginning of May to the end of September and games take place on Saturdays in the Pharmacy and Eglinton area and Sundays in the McCowan and Steeles area. You can either register as an individual player and be placed on a squad, or you and your friends can register your existing team (minimum of 16 players per team). We have 2 divisions of play (Recreational and Competitive Division) and teams are guaranteed a minimum of 13 games per season. We conclude our season with championship playoffs for teams that qualify. We also have an Archangel Cup Tournament that combines both leagues which starts mid season and concludes at the end of September. Stats are updated weekly on our website and trophies are awarded at the end of the season to Playoff Champions and Golden Boot winners. Monetary discounts are also offered to regular Season Champions who return for another outdoor season. St. Michael’s Soccer Club and Maple Leaf Soccer Club run a joint indoor program at the Ultra Sports Centres located in the Birchmount and Ellesmere area. Our programs run on Sunday, Monday and Tuesday evenings and game times range from 8p.m. to 11p.m. We generally offer recreational, competitive and men’s open programs across all three nights. Players can register as an individual, as a small group or with their existing team. Our indoor season is divided into 2 sessions which run from November to February and from February to May. Teams are guaranteed a minimum of 12 games up to a maximum of 14. In addition to a 12 week regular season, we conclude with 2 weeks of playoffs. Stats are updated weekly on our website and trophies are awarded at the end of the season to Playoff Champions and Golden Boot winners. Monetary discounts are also offered to regular Season Champions who return for another indoor season. The Archangel Cup Tournament is a 16 year tradition with St. Michael's Soccer Club and Maple Leaf Soccer Club and provides the players and teams an opportunity for interleague play across the 2 different soccer leagues. The tournament takes place during the outdoor season and typically starts at the end of June. Subsequent rounds of the tournament occur on select Saturdays or Sundays throughout the remainder of the outdoor season and the tournament generally concludes in September. Trophies are awarded to both the tournament finalists and champions and the winners in each division get their team name engraved on the coveted Archangel Cup trophy. Players can either register as individuals, with their friends or register with their existing team.